The National Air and Space Museum (NASM) JUST announced this monring (Feb. 28) the schedule for the Space Shuttle Discovery coming to Steven F. Udvar-Hazy Center in Chantilly, VA. 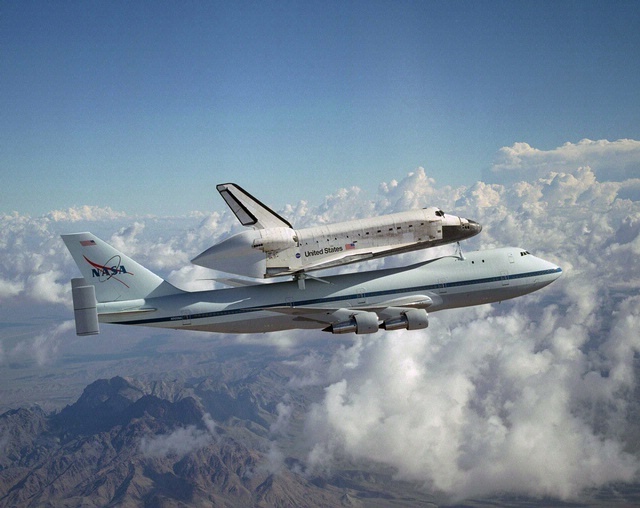 Discovery will fly into Dulles International Airport atop the NASA 747 Shuttle Ferry aircraft on April 17.The official transfer of Discovery to the NASM will be on April 19 and will initiate four days of space related activities. The dates are weather dependent. This is one event not to miss as this will probably be the last time we see such a spectacle in the Washington D.C. area. Here is the website where you can follow the progress of Discovery, take a look inside the flight deck and cargo bay, and get further information: http://www.airandspace.si.edu/collections/discovery/. I can hardly wait for her arrival. I plan on seeing this in person. Hoe sbout you?